Illiniza Norte, from the refuge cabin. 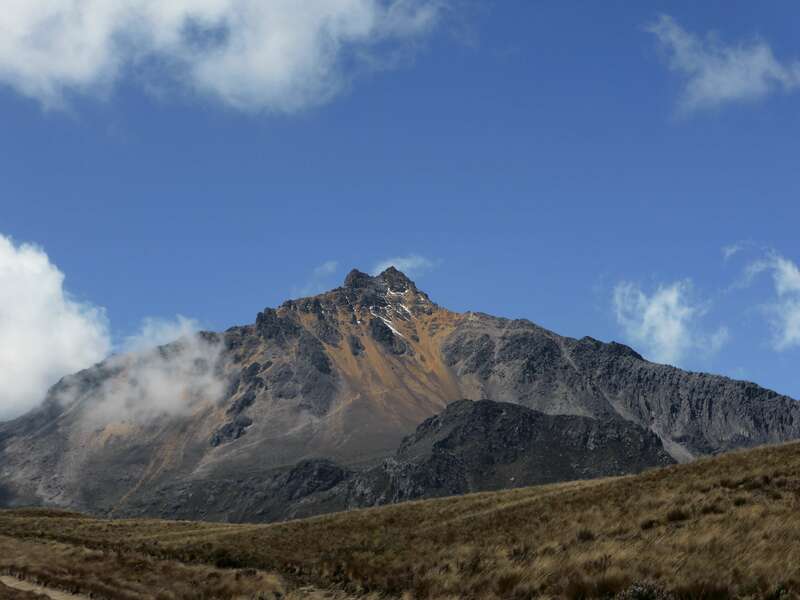 5126m Illiniza Norte, the northern of the two Illiniza peaks, is Ecuador’s 8th highest mountain and a popular acclimatization hike. An extinct volcano, the two Illinizas were once connected, but have long since become separate peaks with distinct characteristics. 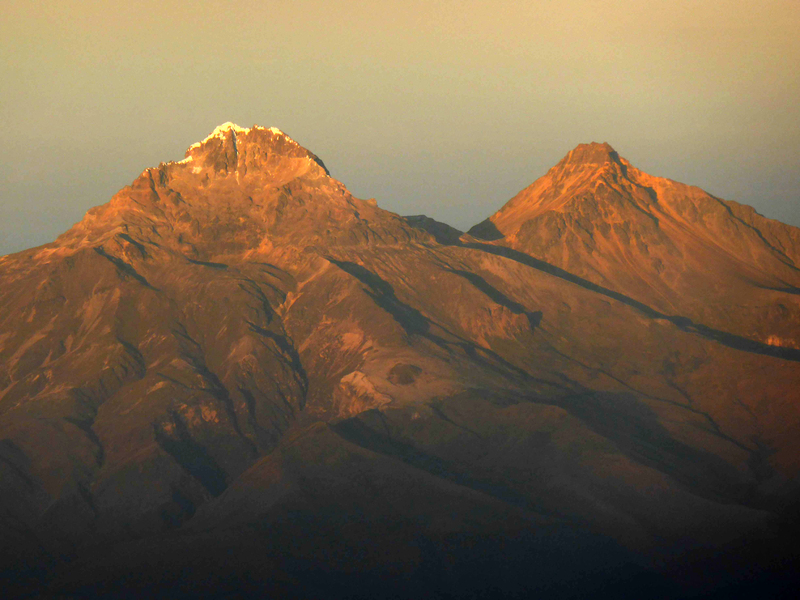 Illiniza Sur, left, and Illiniza Norte, right, as seen from near the summit of Corazon. I visited the Illinizas on my third day in Ecuador, one day after hiking the nearby 4791m Corazon volcano. 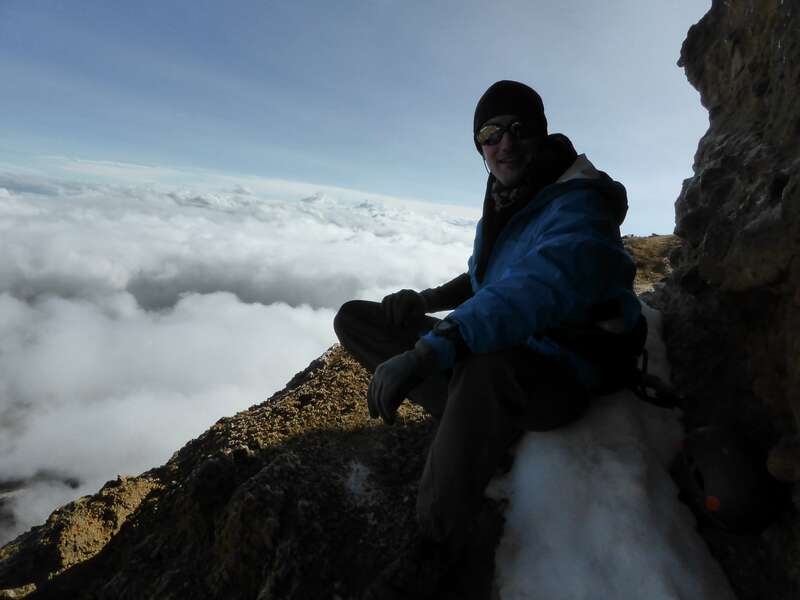 My acclimatization and climbing itinerary can be seen here. 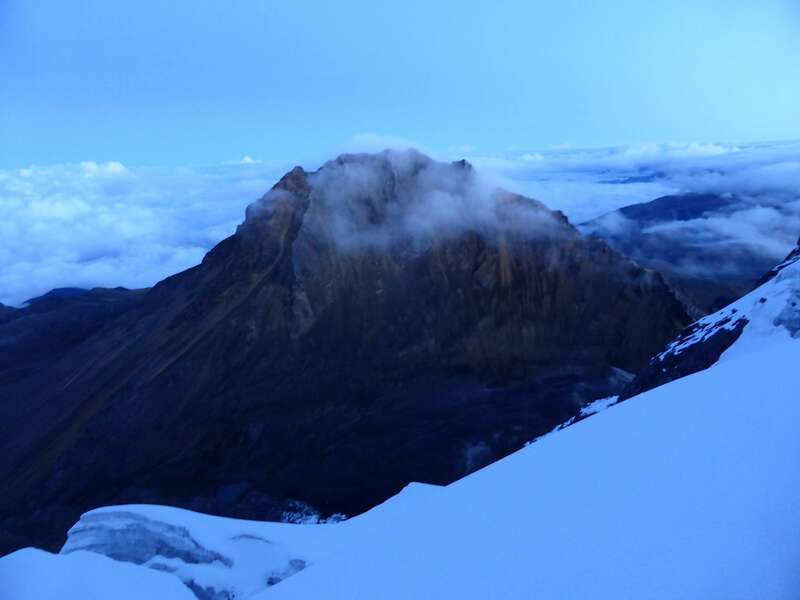 5263m Illiniza Sur, the slightly higher southern mountain, was one of my main climbing objectives in Ecuador, and Illiniza Norte presented a convenient acclimatization opportunity. Illiniza Norte turned out to be a thoroughly enjoyable hike in its own right, and well worth the day of travel time which I budgeted for climbing it. 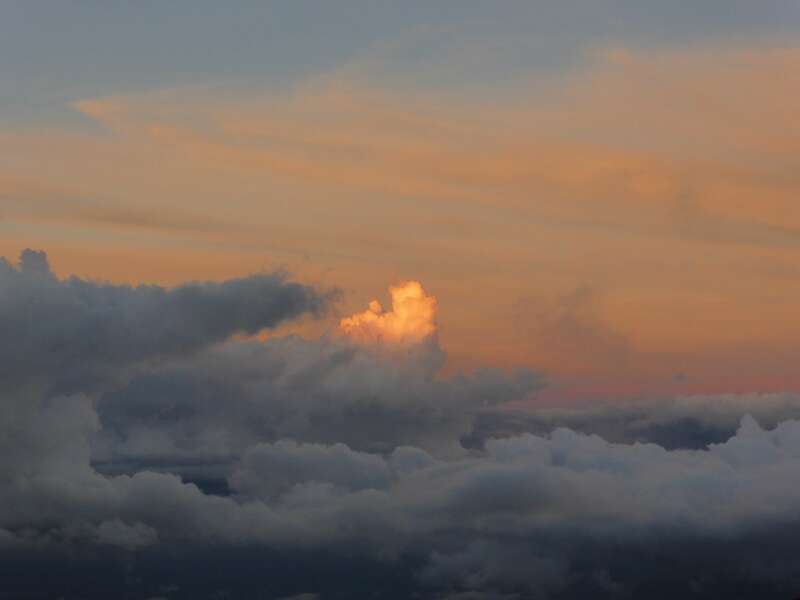 Illiniza Sur, left, and Illiniza Norte, right, from the summit of Cotopaxi at sunrise. Day 1: My climb of the Illinizas started at my hostel near the city of Machachi, south of Quito – a popular area for climbers to base out of due to its proximity to numerous 4000+m hiking peaks, as well as both the Cotopaxi and Illiniza national parks. A short drive from the hostel brought us to the Reserva Ecologica Los Ilinizas national park, where my mountain guide and I registered our names. We continued from the gate over a rough road to the climber’s parking lot. 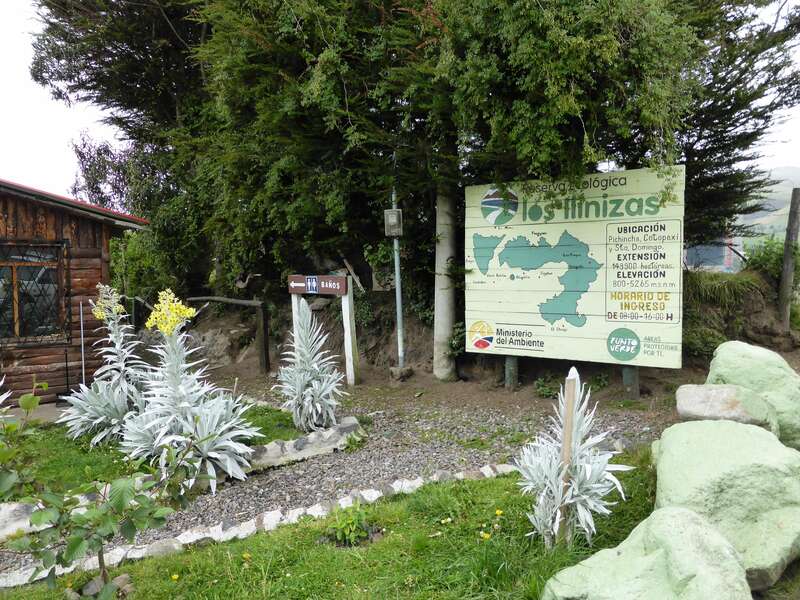 The Reserva ecologica Los Ilinizas park entrance. 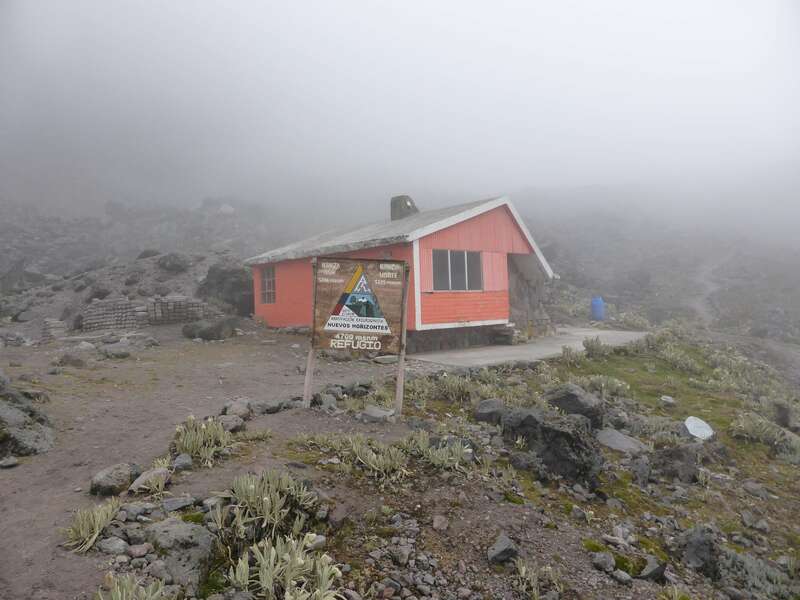 Ecuador’s volcanoes are fantastic in their accessibility, and many can be climbed from mountain cabins. 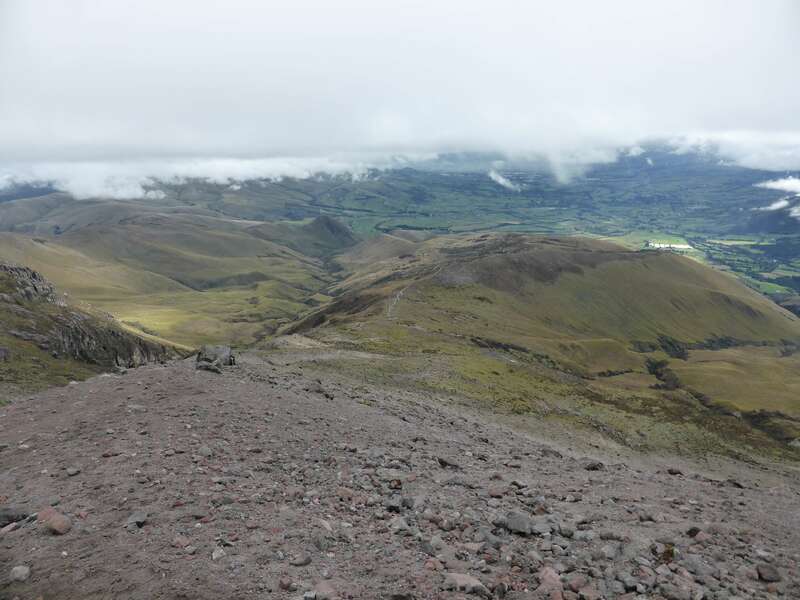 During my visit to Ecuador the cabins at the base of Cotopaxi and Chimborazo were closed for construction, but the cabin, or refuge, situated near the saddle between Illiniza Norte and Illiniza Sur was open for business. The climber’s parking lot and access point for the Illinizas. 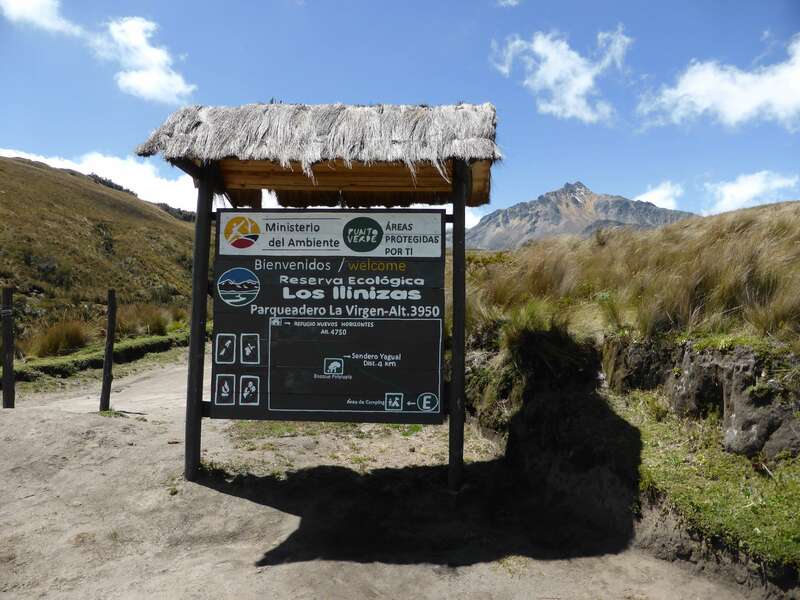 The Illiniza refuge can be reached via a clearly signposted and moderately sloped hiking trail from the parking lot at 3950m. Loaded up with climbing equipment for Illiniza Sur, sleeping gear, food and snacks for three days in the refuge, and carrying my heavy double boots inside of my pack, we began hiking up the trail around noon. Having recently come from near sea level I found maintaining steady output at 4000m to be quite taxing, so I focused on breathing slowly and steadily while forcing myself to move at a very conservative pace. The effects of altitude were pronounced, and I could feel quite clearly that I was not yet properly acclimatized. Looking down the trail towards the parking lot, roughly halfway to the refuge. As we moved upwards the weather turned, and blue skies were replaced by clouds and a light rain. Higher still, cold fog engulfed everything and obscured our views. This would become a consistent and predictable pattern throughout my stay in Ecuador – clear mornings with weather quickly deteriorating in the early afternoon. After roughly three hours of hiking we reached the refuge at 4700m. The mountain cabin, just below the saddle between the two Illinizas. The refuge was basic but comfortable enough, and definitely preferable to camping in the cold humidity waiting outdoors. 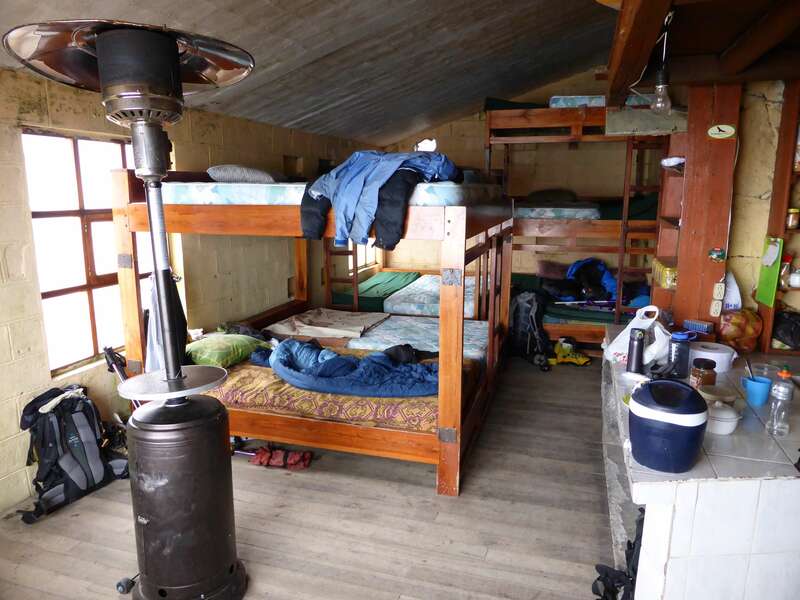 Sturdy wooden bunks accommodate climbers and their gear, and thick mattresses provide a soft bed. The guardian of the refuge, a young man named Freddy who resides there permanently during the climbing season, kept hot water boiling, cooked hot food at mealtimes, and watched everyone’s gear for a nominal fee. The cost for my mountain guide and I to stay in the refuge for three days ended up being around $70 USD, including food. 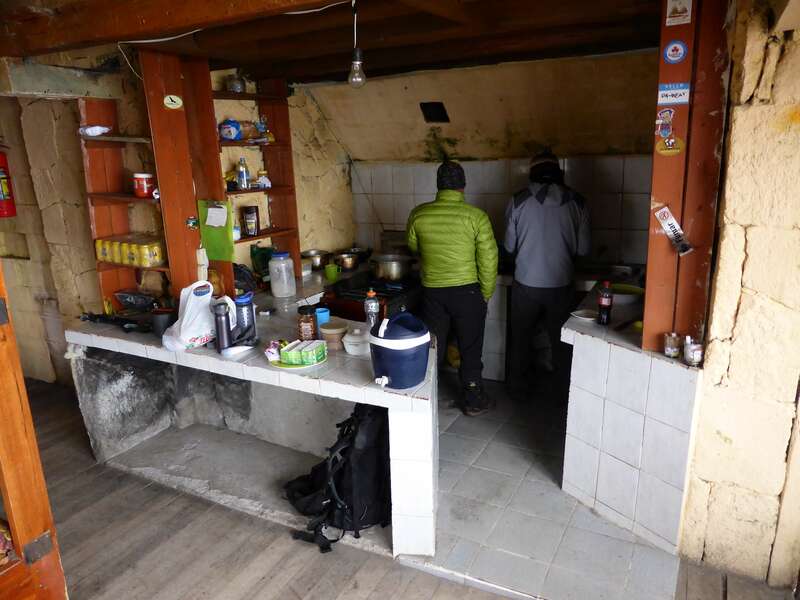 Constant access to boiling water compounded the convenience of the cabin, and its location at 4700m makes it an excellent spot for acclimatizing. My mountain guide Pato with Freddy the refuge guardian in the cabin’s kitchen. As evening approached the cloud cover descended and opened up views of Illiniza Norte. A large group of Polish climbers arrived later in the evening, and would depart again very early the next morning. Still feeling the effects of altitude, I went to sleep early after some extra hydration, hoping that I would feel better in the morning. Sunset from the Illiniza refuge. Day 2: We were up early and on the trail at 7:45. 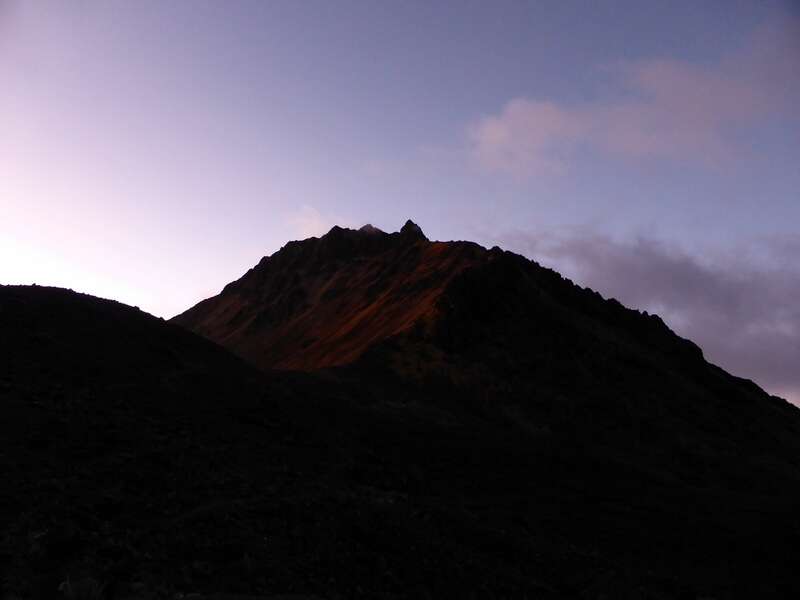 The beginning of the route was straightforward hiking, first from the refuge, crossing the saddle to the base of the mountain’s southeast ridge, and then following the ridge itself directly upwards. The large Polish group had left many hours earlier than us, and we wouldn’t encounter them again on the mountain; we had the route all to ourselves. The beginning of the southeast ridge. Higher up the ridge became steeper, and the route began to involve some exposed scrambling over rough volcanic rock. Hand and footholds were secure and abundant, making the climbing very enjoyable. 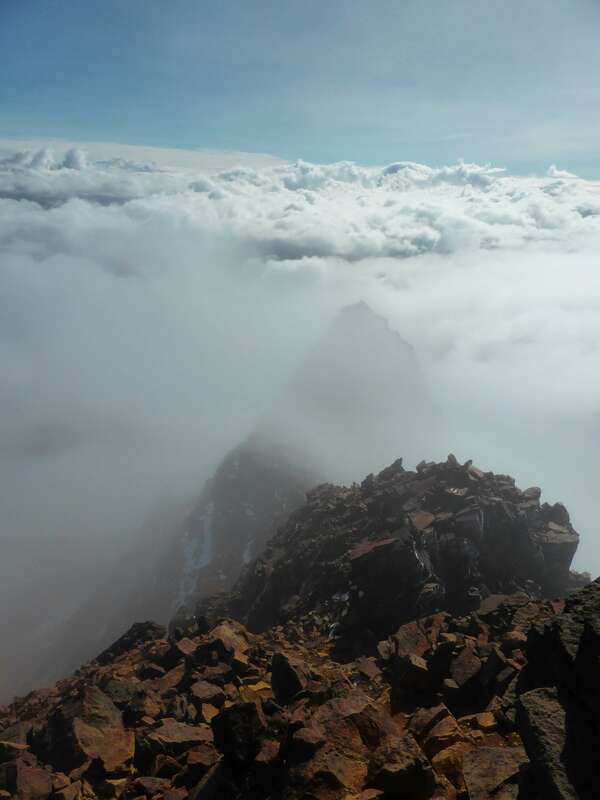 Looking across the clouds from Illiniza Norte’s southeast ridge. I was feeling fantastic in the fresh morning air, and despite a light breeze and some light cloud cover moving past us with the wind, the weather was clear and promising. The altitude-induced lethargy of the previous day appeared to have lifted, and I was filled with energy. Climbing unroped we quickly progressed upwards, and scrambling over the rocks with all four hands and feet felt crisp and free. In two locations the route moved off of the ridge and cut to the climber’s right, down and around a pair of false summits. These two sections were fairly easy to spot even without my mountain guide Pato’s indication – although the route ahead appeared to continue over the false summits, the turns off of the ridge were worn from usage. The false summits appeared very climbable, but would have involved a lot more exposure than the normal route which bypasses them. I have tried to indicate these two sections below. Stopping only for a short break we made great speed, and soon found ourselves below the final leg of the route, an icy gully leading straight to the summit. 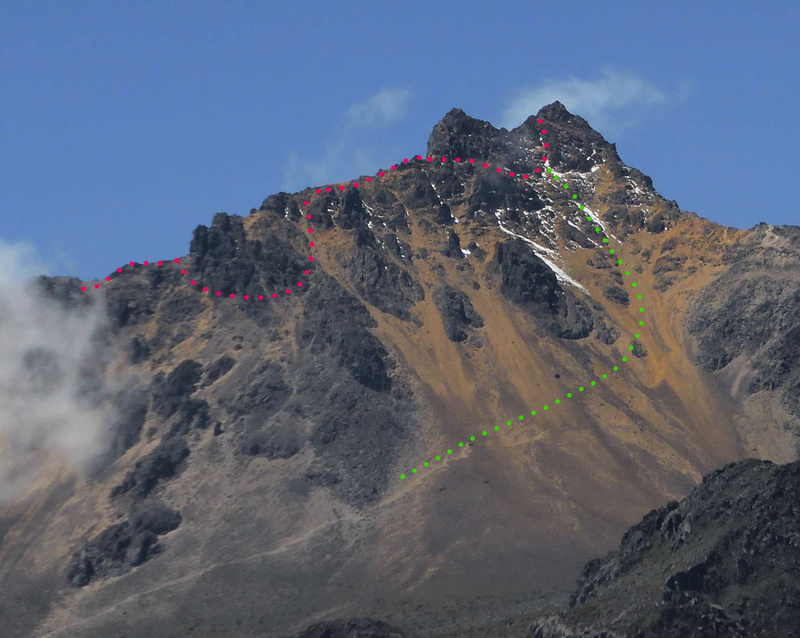 A rough diagram of the route near the top of Illiniza Norte – ascent down and around two false summits, descent via scree on the mountain’s northern slopes. Zoomed in, the gullies which one ascends/descends are visible amidst the rock by the dotted lines. Taking a break above the clouds. 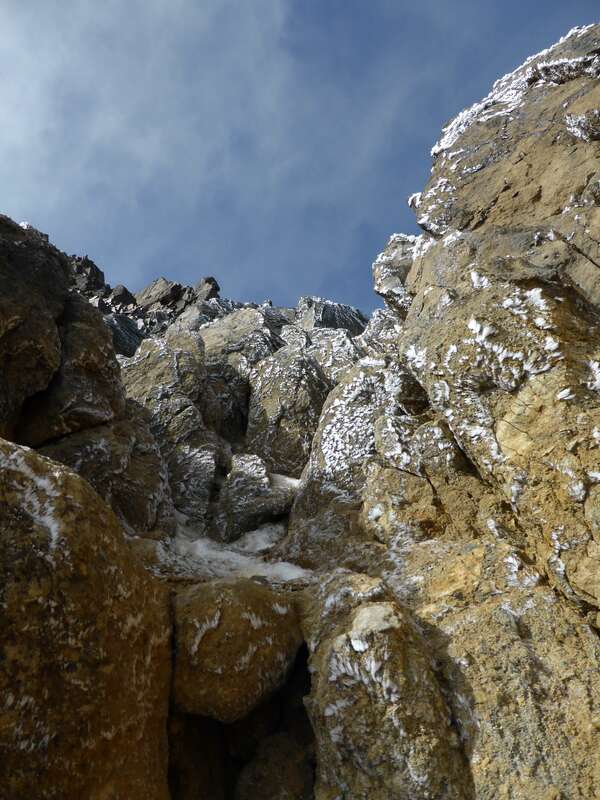 Looking up the final gully to the main summit. Past the final gully we reached the top at 8:55 a.m., one hour and ten minutes after leaving the refuge. The summit, marked by a frozen cross, was windy and cold. 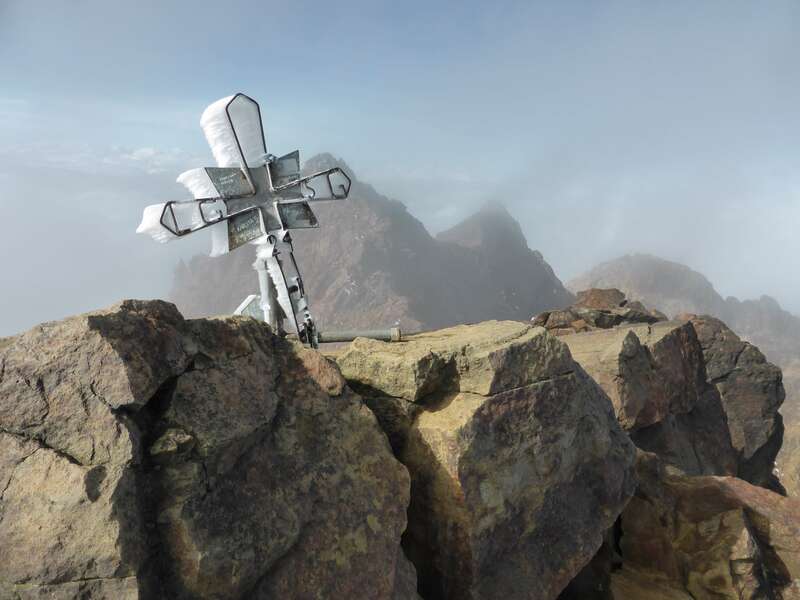 The summit cross of Illiniza Norte. On the summit of Illiniza Norte. Fog blew past us, and periodic windows of clear sky opened to the sea of clouds below us. View from near the summit of Illiniza Norte. From the summit we descended straight down the north face of the mountain, a steep slope of loose scree. Descending on the scree was fast and comfortable, and with little route finding involved we found ourselves back at the Illiniza refuge by 9:30 a.m. The rest of the day was spent resting, eating, and hydrating in preparation for our planned attempt of Illiniza Sur the next morning. Illiniza Norte, from Illiniza Sur at sunrise. Illiniza Norte was a short but very enjoyable hike. The scrambling on route was solid and a lot of fun. Fall exposure in some areas was considerable, but with an abundance of great holds the terrain felt easy enough to climb fast and unroped. The hike was straightforward to access due to the mountain cabin, which also makes the Illinizas a superb area for acclimatization. 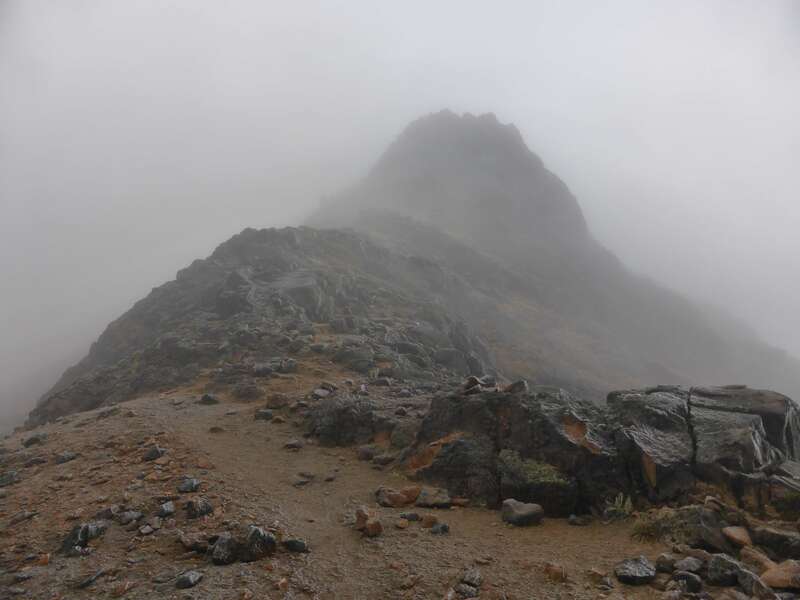 Ecuador’s high mountains can be climbed year round, but weather is often inclement with high winds and heavy precipitation. December, January, and February are considered the most stable months for climbing due to lower winds and relatively lower chances of rain and snow. The Ecuadorian climbers I met told me that June, July, and August are also popular climbing months, drier but very windy. During my trip fog and rain were common in the afternoons, while morning and night weather was typically clear but windy. 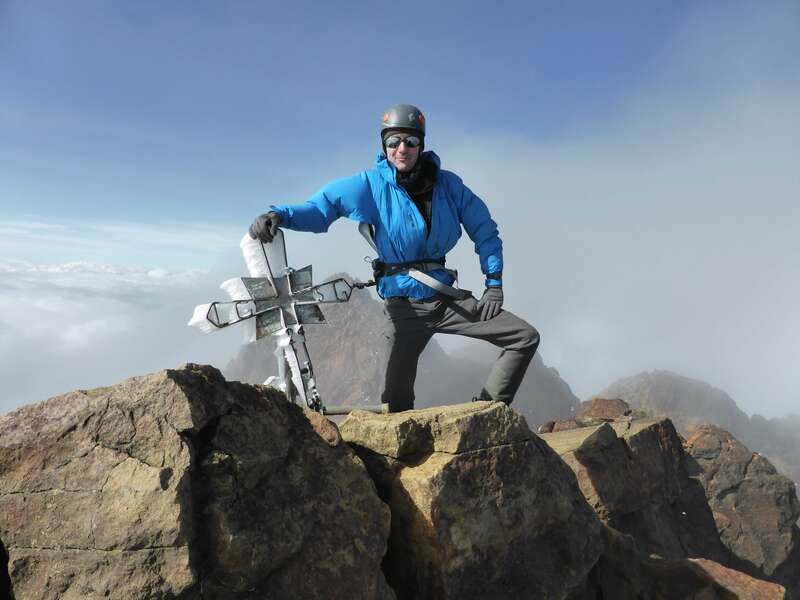 Since late 2012 the Ecuadorian government has mandated that all climbers use the services of a local mountain guide. This policy was put into place in response to a fatal accident on Illiniza Sur. 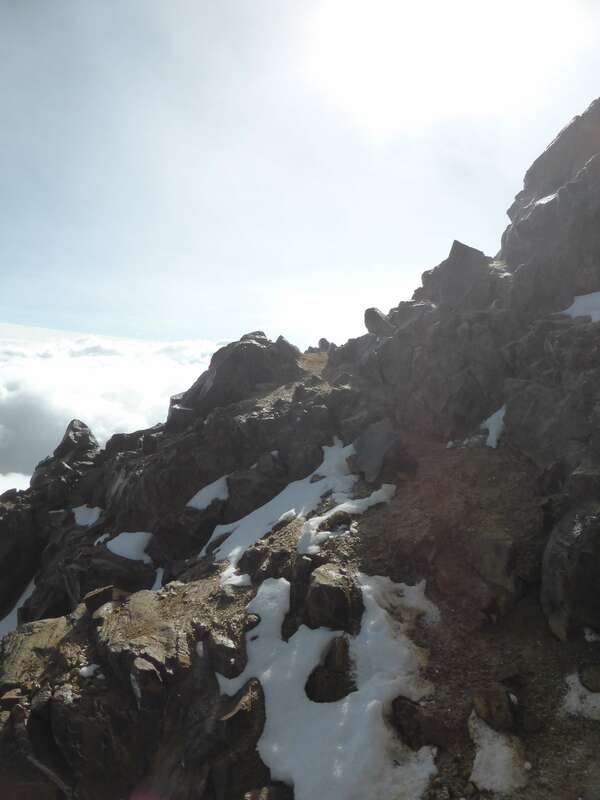 While in Ecuador I met one unguided group who had snuck onto the mountain, but this is discouraged, and the national parks enforce the policy by refusing entry to unguided climbers. I hired a 1:1 mountain guide and climbed with him throughout my trip. We accessed all of the national parks via a 4×4 truck, which my guide drove and owned. While organizing the logistics and guide for my trip I used the services of Diego Cumbajin Parra, the owner of www.andesclimbing.com, and I would strongly recommend him for his excellent communication, attention to detail, personal presence, and reasonable pricing. My guide Pato was strong, very familiar with all of Ecuador’s mountains, and completely focused on climbing. 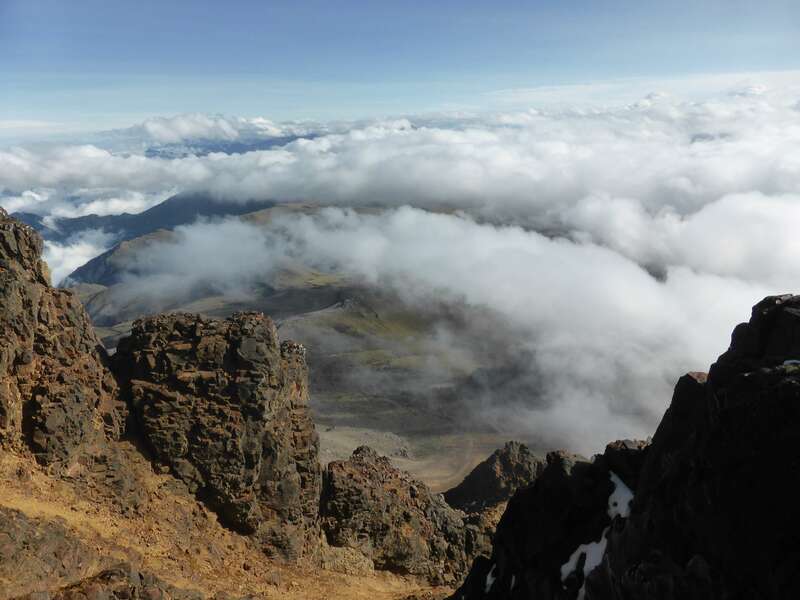 This entry was posted in Ecuador, Hiking and tagged Ecuador, Iliniza Norte, Iliniza Sur, Illiniza Norte, Illiniza Sur, Machachi by Ian. Bookmark the permalink. I remember descending on that scree slope 5 years ago. It looks crazy on that map but was actually incredibly easy. Absolutely, the descent was very comfortable. Some parties ascend via that same scree slope, although I doubt it’s very pleasant.